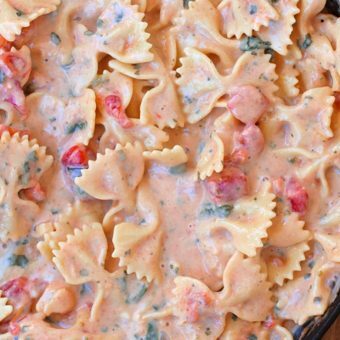 I make a variation of this creamy pasta dish at least once a month. 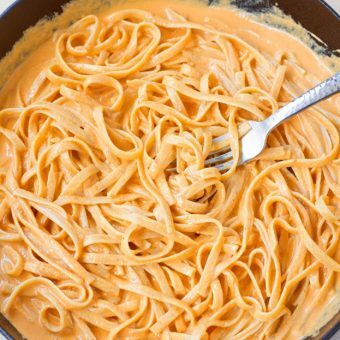 The sauce is a wonderful addition to everything – pasta, vegetables, garlic bread, or even served in a bowl as a rich and creamy soup. 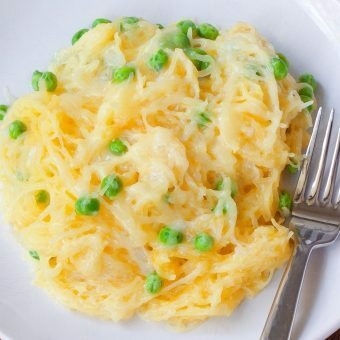 It’s also great over spaghetti squash if you want to save calories – See: How To Cook Spaghetti Squash. 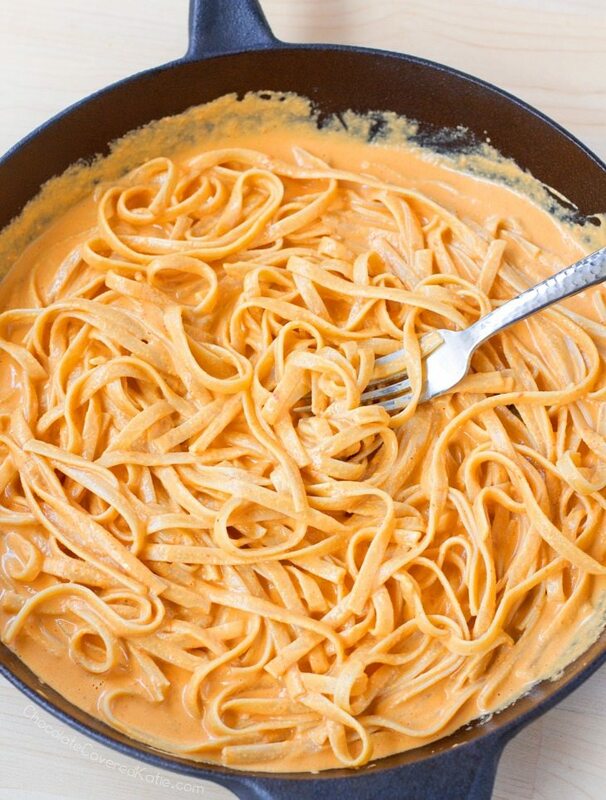 Instead of heavy cream, the richness in this alfredo comes from the heart-healthy cashews, which are one of my favorite versatile plant-based ingredients to work with, as they can be used in both sweet and savory recipes to produce incredible creaminess without any heavy cream or dairy. This sauce comes together really easily. 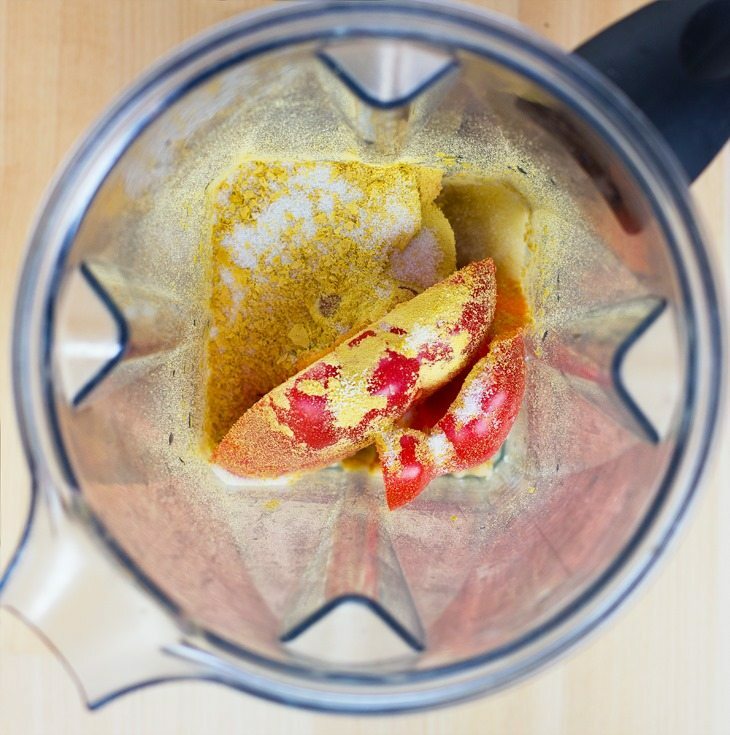 Just throw the ingredients into a blender and process until smooth. You can heat the sauce while making your pasta, so everything can be done and ready to eat at the same time. Italian that I am, pasta is one of my favorite foods. optional grilled or roasted veggies, beans, etc. Place the nuts in a cereal bowl, cover with water, and let sit 6-8 hours. Drain fully, and pat dry. 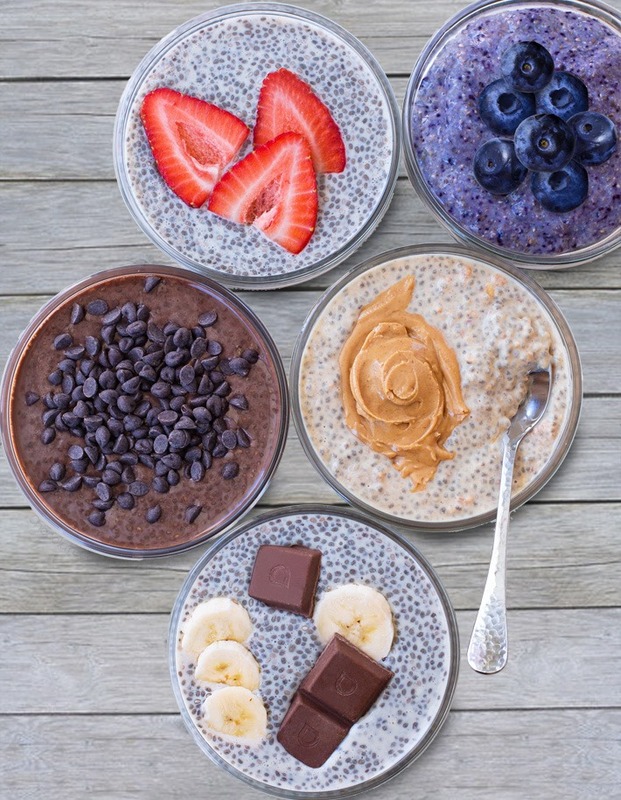 Blend all ingredients (including 1/2 cup water) except pasta and optional veggies in a food processor or high-powered blender until completely smooth. Heat sauce in a pot until desired temperature is reached while cooking pasta in salted water according to package directions in a separate pot. Drain pasta fully, but do not rinse. Pour the sauce over the pasta, season with salt and pepper as desired, and stir in cooked vegetables, beans, or other add-ins if desired. *If you increase the water to 1 cup, the sauce also makes a really nice and creamy soup. I know this is off-topic but I’m not sure the best way to reach you. My mom is making me the Pink Princess Cake from your cookbook for my birthday party this weekend 🙂 but we want to make mini cupcakes instead. Or possibly regular cupcakes. Have you ever made cupcakes with this recipe? Do you have any tips on cooking time for either mini or regular cupcakes? Thank you so much! I just made those last week as mini cupcakes!!! I think I cooked for 10 or 13 minutes. I would do 10, then check with a toothpick, if it comes out clean, they are done. PS they are soooo yummy and moist! Would pecans work just as fine? Not sure it would be as creamy. But be sure to report back if you experiment! Pecans don’t break down or taste the same as cashews. I have found that adding riced or blended beets will give pasta dishes that red color we’re used to with tomato sauces. With spices, you can’t tell the difference. How many calories is it on its own without the pasta? Thanks! YUM! This sounds so simple and delicious. Cashew cream-based sauces are THE BEST. You could probably just leave them out for a basic alfredo sauce. Or maybe try tomatoes or even steamed carrots? If you experiment, be sure to report back! This looks amazing and I can’t wait to give it a try! 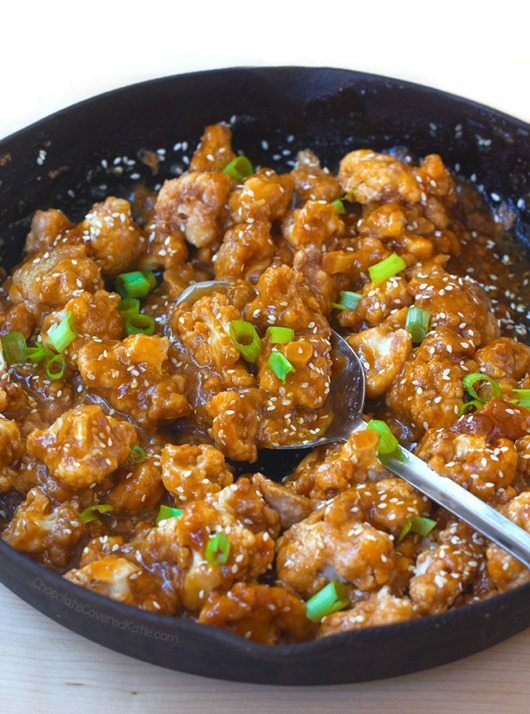 I just made this recipe for dinner and ate way too much because it was so delicious! So easy to make and really incredible flavor…loved it! I added some mushrooms, garlic salt and pepper. Thanks so much for the great recipe, it will be one of my favorite go tos for the future! ? This may seem silly, but is the 1/2 cup cashews 4 oz/112g or 2oz/56g? Packaging lists 1/4 cup as one ounce, but I wasn’t sure if you meant 1/2 cup by volume or weight. Thank you! Also curious to the answer to your inquiry! I’m assuming she’s done it by volume. Hoping Katie replies! Consider using Silk unsweetened cashew milk, instead. It’s pre-prepared and would cut the prep time considerably. 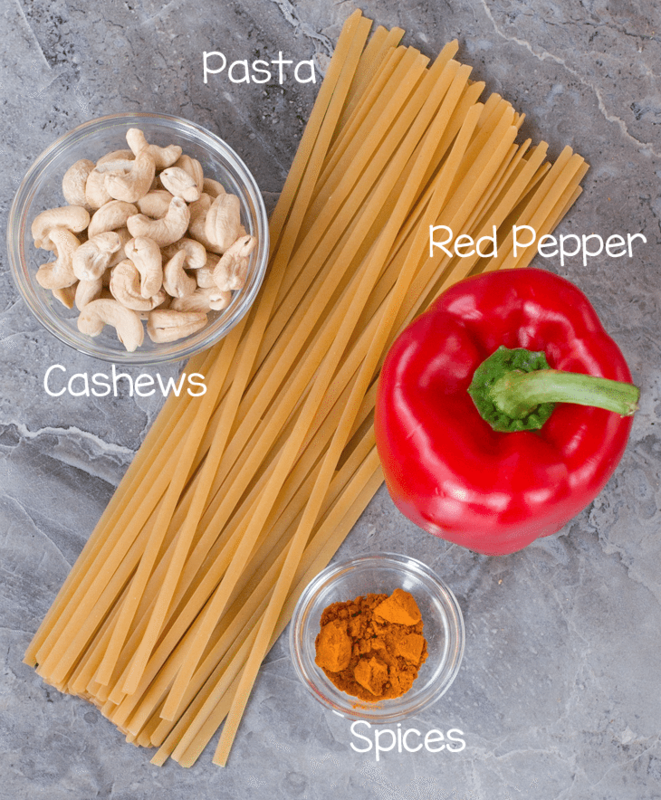 What an interesting recipe…I had no idea that cashews would be in there! 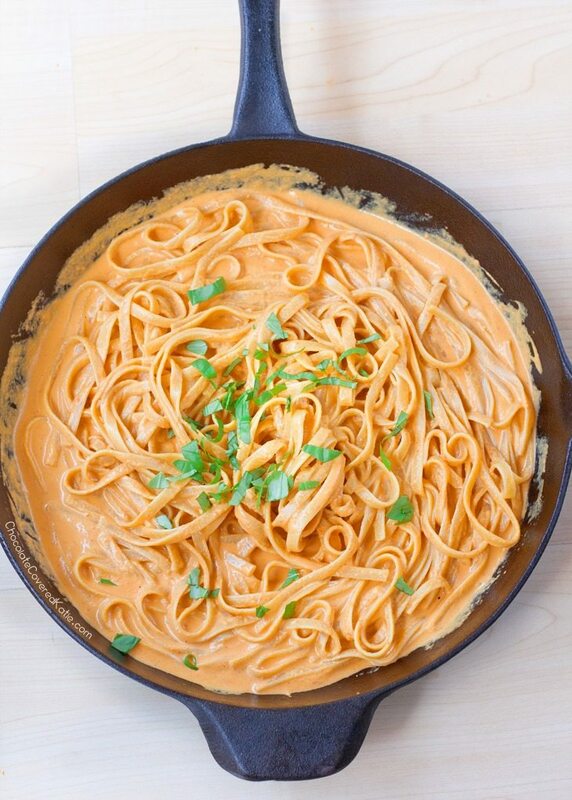 I make a similar pasta dish but I actually add roasted red pepper dip. I can seehow cashews would make it extra creamy! I think I’ll add them the next time I make it. Have you ever tried storing the sauce for a few days? Just wondering if it’d keep well? Cashews are soaking right now. Can’t wait to try this! My 1.5 year old is the pickiest of all picky eaters, so your recipes have been a God sent, because I get to sneak all kinds of good stuff into him. I wanted to report back on the outcome. It was absolutely delicious and will surely become one of my go-to recipes. Instead of regular red peppers, I roasted mine (400F for 40min, flip half way through). So creamy, and oh so good! Should you roast the pepper first? Our use it raw? Thanks Katie for the recipe! Can’t wait to prepare it! Made this for dinner tonight and it was delicious. Everyone enjoyed it. Is there a faster way for the cashews! Wanted to make this tonight but didn’t read through the entire recipe early enough! You can also cut the soaking time from six hours down to one if you use boiling water to soak the cashews; you don’t need to boil the cashews themselves, just put them in a heat-safe bowl, put on a tea kettle, and pour the water over the nuts when it starts boiling. Sara, Consider using Silk unsweetened cashew milk, instead. It’s pre-prepared and would cut the prep time considerably. I don’t know that it would work. Cashewmilk has much less fat and would therefore be much less rich and creamy. But if you try it, be sure to report back with results! Tried this recipe tonight but used cream cheeses instead of cashew nuts. 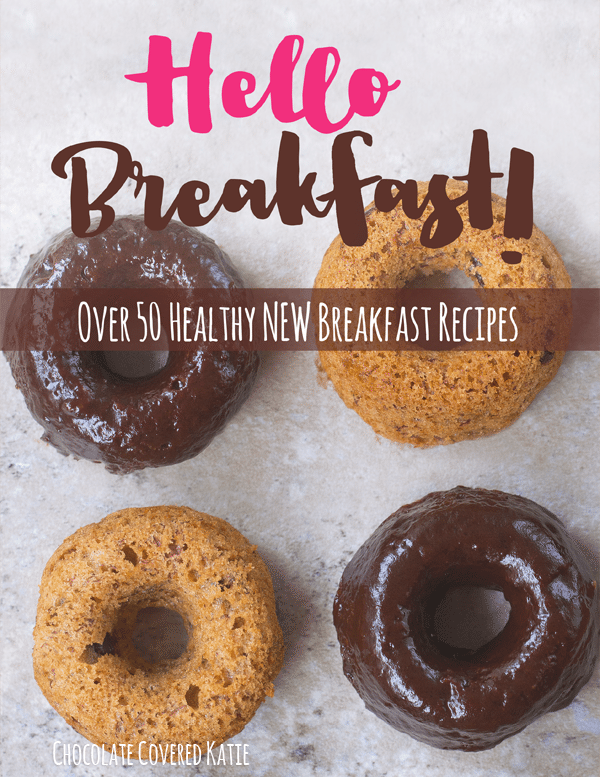 I am not a vegetarian but follow your blog as a coeliac with a sweet tooth! Had it with thick rice noodles plus a few large prawns. Lovely?? How much cream cheese did you use, Donna? That sounds really good too. I have some spaghetti squash to use up and was looking for a good sauce recipe.